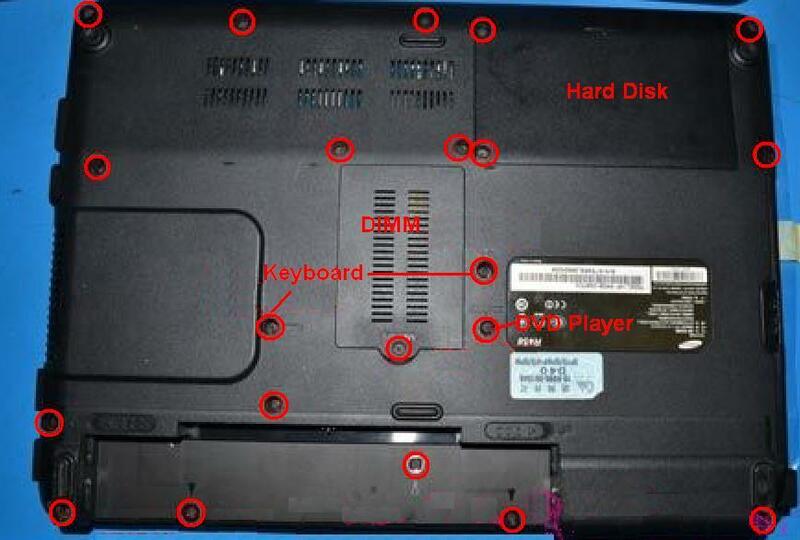 In this guide, the actual laptop is Samsung R458. 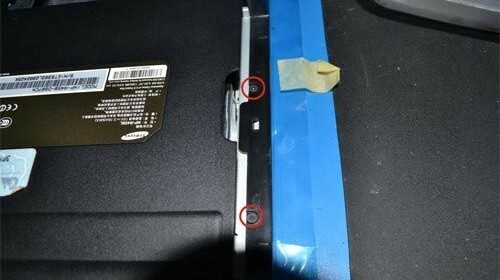 If your laptop is Samsung R408, R410, R453 or R460, you can refer to this instruction too, it is similar. First of all, turn off your Samsung R458. Disconnect the AC adapter and remove the battery, then hold down the power button for at lease 20 sec's to drain the residual charge from the system. 1. Turn the laptop upside down. Remove all the screws from the bottom that you can find and store them safe. 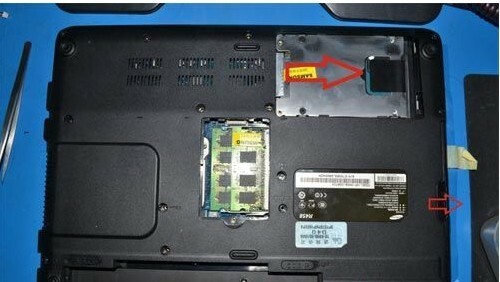 Remove the DIMM cover and Hard Disk cover. 2. Pull out the DVD player nad Hard Disk. 3. 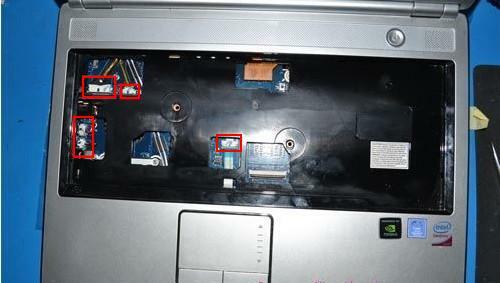 You can find two screws under the DVD player , remove these two screws. Now, turn over your Samsung R458 and open it. Remove the keyboard. 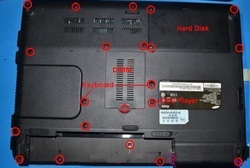 You can read our another post How to Replace Samsung R458 Keyboard. 4. Unplug the four connectors which are indicated by the red rectangles in the picture. 6. Remove the center cover. 7. 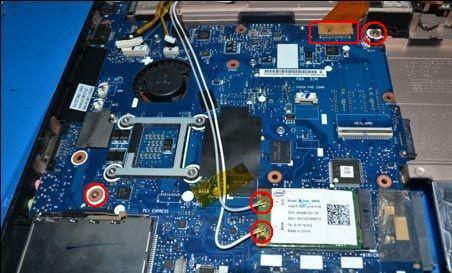 Unplug the wireless Lan cable and unscrew the two screws securing the motherboard.. And unplug the cable which close to display. 8. Now, you can take out the motherboard. Turn it over you can access the cooling module. 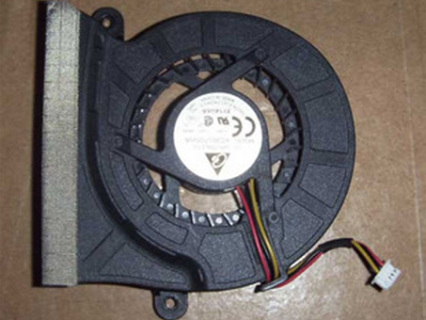 If you just want to replace the fan, unscrew the two screws and unplug the fan cable. I marked them by red. 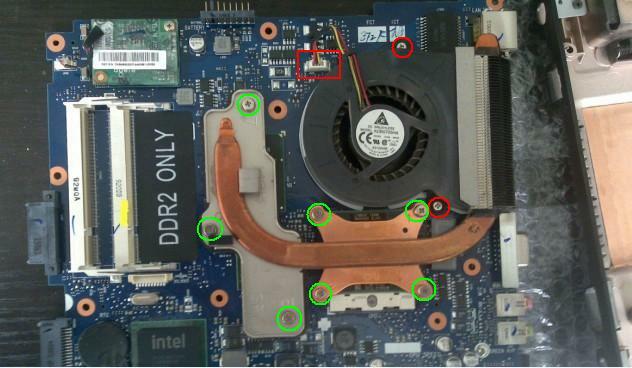 If you want to clean or replace the heatsink, you need to remove seven screws circled by green. Reverse the procedure to install new Samsung R458 Fan and assemble the computer.